1. Wash and soak the rice. 2. In a pan heat ghee or oil and add the cloves, cinnamon stick and cumin seeds. 3. When they crackle, add the onion and saute. Add the chopped vegetables, salt and saute.Simmer to cook until almost done. 4. In a pan heat a little oil and fry the rice.Add salt and sufficient water to cook. 5. Bring to a boil and when half done, simmer it until almost done. 6. Now add the vegetables and stir carefully. Serve with raita / papad. Wow adding chutney to Rice, it must have given it a very good flavour.Thanks for linking it up to Lets Cook rice event. 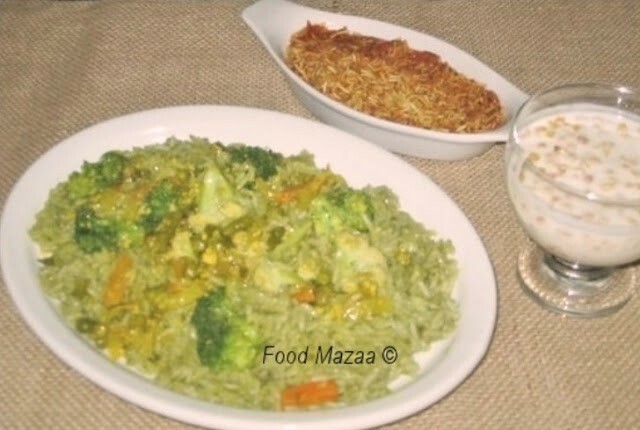 Sound delicious pulao with nice colour.